Seatway TP is a premium, high performance, retractable (telescopic) seating system that is custom-engineered to suit specific spaces and design concepts leading to flexible seating configurations. 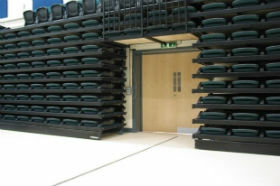 Seatway TP retractable platforms have been developed in the UK. 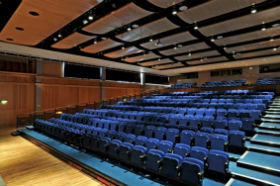 Specifically for use in facilities such as performing arts centres, theatres and school auditoriums where a more solid feel to the structure is required and where full theatre folding chairs need to be installed. The innovative spaceframe concept behind the TP retractable system features a fully welded platform structure rather than a set of bolted together components. 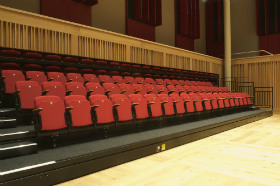 The product is manufactured in the UK and has become the international acknowledged method for producing high-performance retractable seating systems. 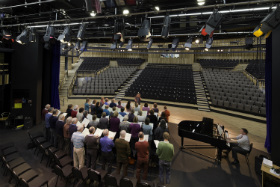 All telescopic platforms are manufactured to order therefore unit width, depth and rise can be designed to maximise audience sightlines and seating capacity. 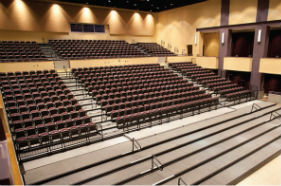 The raked, tiered seating systems come with a 10-year warranty as standard, which backed up with our comprehensive maintenance packages will allow our seating to become a fixture in your facility for years to come. This is a custom feature that we can offer to enable access through the seating unit at the floor level. 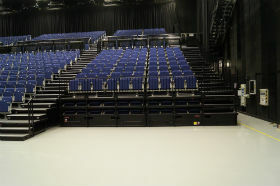 This allows the retractable seating units to be partially opened with the front rows closed, thereby creating a raised seating area. Load transference posts, front rails and mobile step units are standard accessories with this design. Low rise platforms are available from 150mm for use with portable chairs. Used to compliment Hussey Seatway retractable seating installations or as a stand alone item. We understand the flexible nature of the multipurpose spaces in which our retractable systems are installed. Our electronic partial opening allows the end user, at the flick of a switch, to select the desired number of rows, therefore offering the ability to alter capacity depending on the requirement of the event. This feature is available with our Seatway TP system only.